How can this so very true image have caused SO much grief in the “interwebz” world? 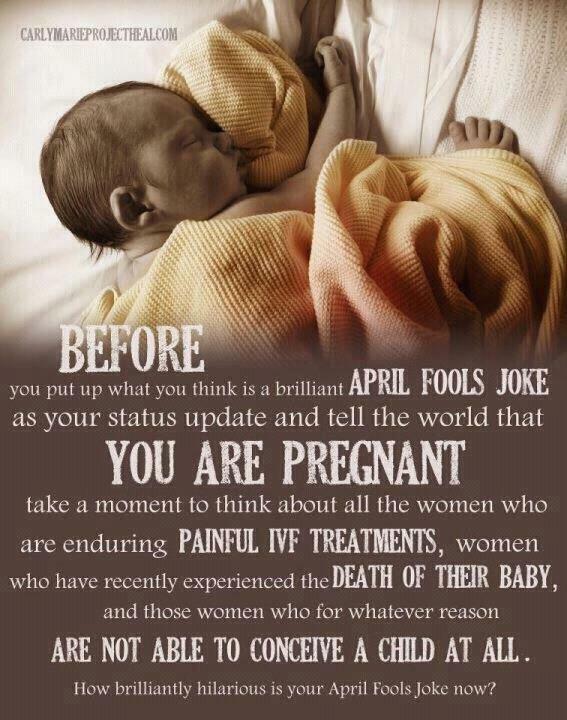 I have seen some hideous comments made, including “how dare you post a photo of a dead baby” and ” you are having a pity party” and that WE are the ones who need to learn to take a joke….In our community, when we read of someone announcing a pregnancy early, prior to 12 weeks, we don’t immediately squeal and begin to buy baby clothes. We mentally and physically cross our fingerd and hope and pray like crazy that these people announcing a pregnancy on the first day of April do not EVER EVER EVER experience the loss of this newly announced pregnancy. Then to have revealed that it was “just” a joke, after having messages of congratulations and well wishes from people like us just wanting them to be happy hurts like anything. It DAMN HURTS to have those wishes thrown back in our faces. Thinking before we speak would solve a lot of problems! For the record, the baby in the picture is very very alive, the picture is just sepia toned, and for the few people out there who thought we were just having a “pity party”, there were hundreds of people who merely told Carly “Thankyou for putting our feelings out there”.